Meg's Food! 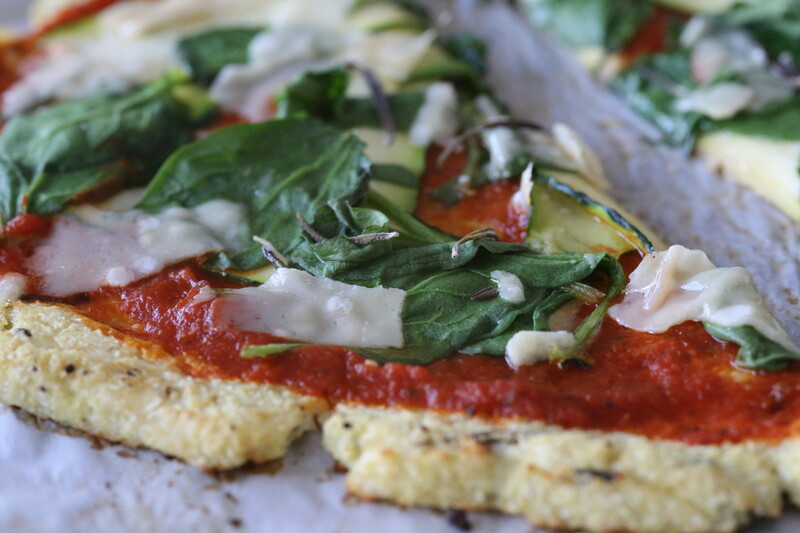 | Cauliflower Crust Pizza - Meg's Food! I’m always a little skeptical about new health food fads. 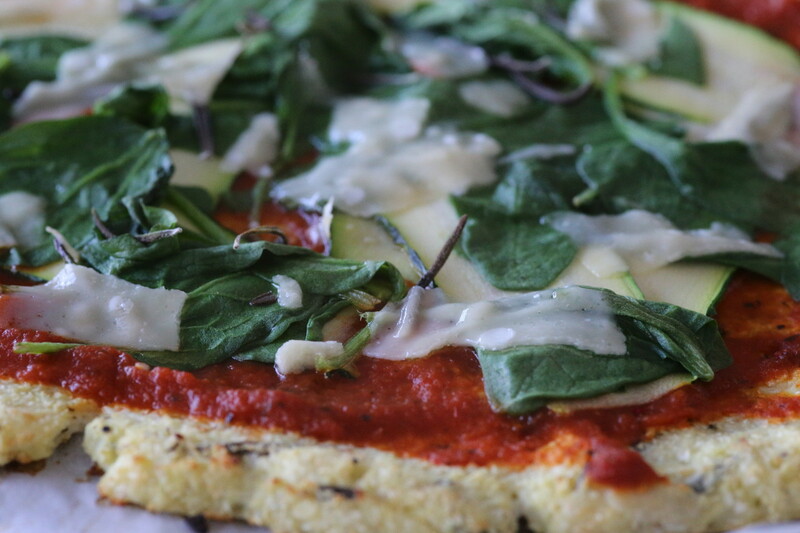 I’ll admit it took me awhile to get on board with cauliflower rice (even though I love it now), and I’d heard about cauliflower crust pizzas for awhile before I was willing to try it. I mean, cauliflower? Making bread? I wasn’t sure about that. But oh man, I was wrong! 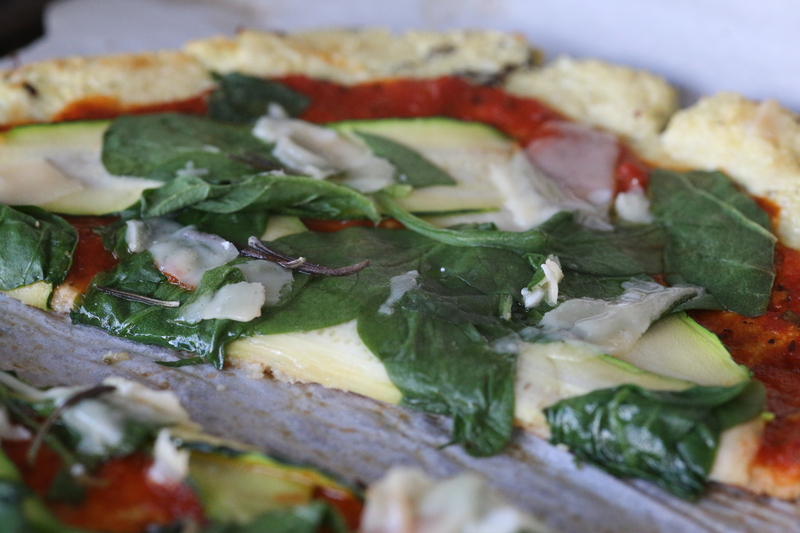 Replacing wheat flour with cauliflower rice makes the pizza gluten-free, and very low in carbohydrates. But that doesn’t matter if it tastes weird, right? Well it tastes amazing! It’s softer than normal pizza dough, and with just a hint of sweetness. But it holds up well to sauce and toppings and makes for a healthier twist on an old favourite. I fiddled around with the crust recipe – some recipes call for a crazy amount of cheese or like 5 eggs (which really takes away from this being a healthier version of pizza, doesn’t it?) and settled on this one. It only uses one egg and just a little bit of mozzarella to hold it together. It’s flavoured with garlic powder, oregano, and fresh rosemary. I made it the day before because I DREAD making cauliflower rice (it’s just so messy!) and it held up well overnight in the fridge. I topped my healthy pizza with homemade tomato sauce, but your favourite sauce will do (just watch out for added sugar! 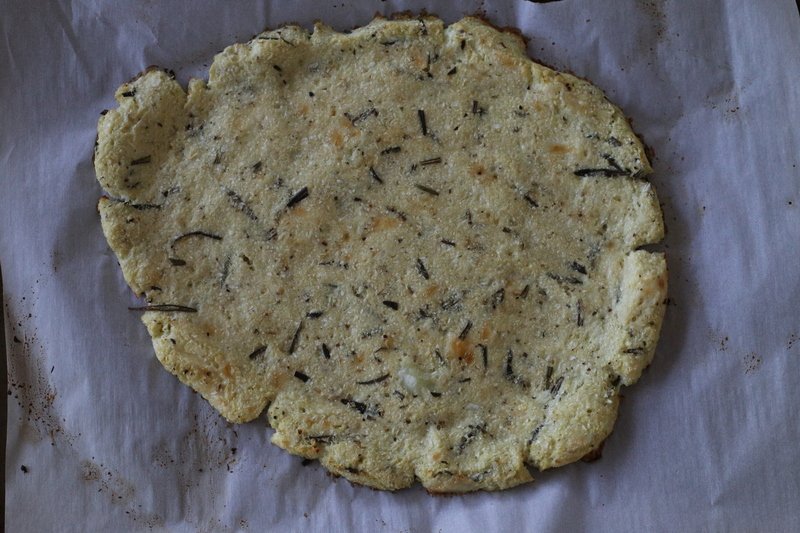 ), some thinly sliced zucchini, shaved parmesan, spinach, and rosemary and basil. YUM! First, make cauliflower rice. 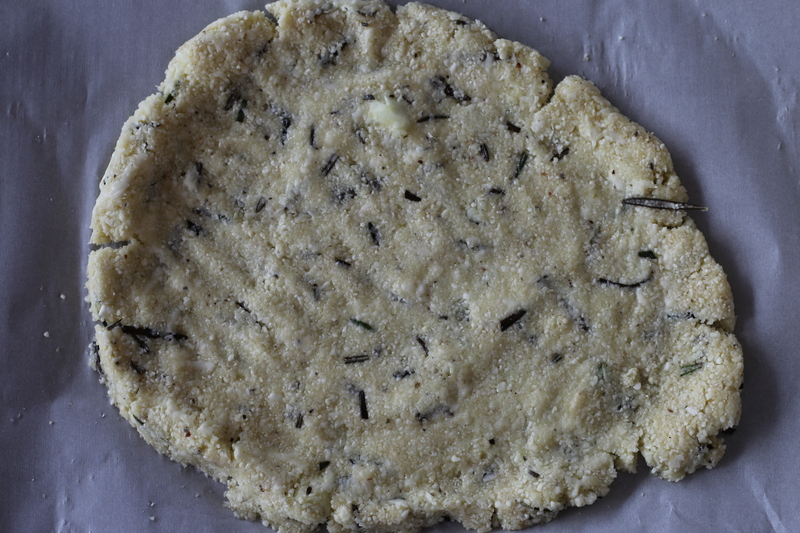 Chop the cauliflower into florets and blend until the consistency of rice. Transfer to a clean dish towel and wring out as much liquid as you can (this is a very important step – make sure you get lots of liquid out!). Transfer to a medium bowl and add garlic powder, oregano, salt, pepper, rosemary, and mozzarella. Add egg and stir to combine. Form into a ball. If chilling overnight, wrap in plastic wrap. Preheat oven to 400 and line a baking sheet with parchment paper. Flatten dough ball out into a round, making the edges a little higher for a nice crust. Bake 15-20 minutes, until just starting to get golden. Remove from oven. Top with tomato sauce, spinach, zucchini, parmesan, and fresh herbs. Transfer back to the oven for about 5 minutes. Let cool a little bit before slicing. Healthy pizza? It exists! When it’s made from cauliflower and topped with more veggies, you don’t have to feel bad about indulging in this one! 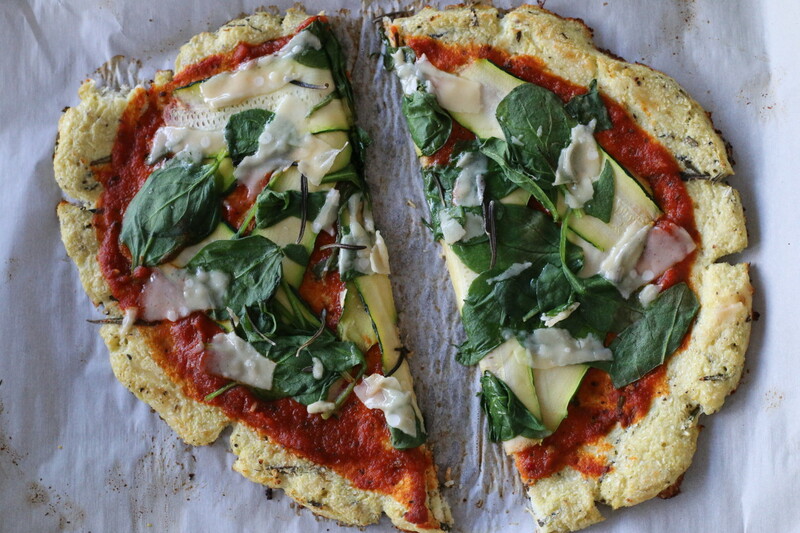 This entry was posted in Dinner, Lunch, Recipes and tagged cauliflower, gluten free, low carb, no added sugar, pizza, spinach, zucchini. Bookmark the permalink.